Protected by its shipping container, GSAT-16 is unloaded from the cargo jetliner following this Indian satellite’s delivery to French Guiana. 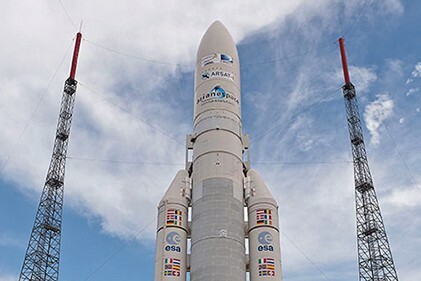 Both satellite passengers for Arianespace’s sixth Ariane 5 mission of 2014 are now in French Guiana, marking a new milestone as preparations continue ahead of this heavy-lift flight scheduled for early December. The GSAT-16 spacecraft arrived this week at Félix Eboué International Airport near the capital city of Cayenne. It was delivered by a chartered cargo aircraft and after touching down in French Guiana, subsequently was unloaded for transfer by road to the Spaceport. Designed, assembled and integrated by the Indian Space Research Organisation (ISRO), GSAT-16 – which will weigh approximately 3,150 kg. at liftoff – is to deliver C- and Ku-band telecommunications services that include very small aperture terminal (VSAT) transmissions, TV broadcasting and emergency communications. GSAT-16’s co-passenger on the upcoming Arianespace mission – DIRECTV-14, built by SSL (Space Systems/Loral) for operator DIRECTV – arrived in French Guiana earlier this month and is being readied for launch at the Spaceport. Ariane 5’s early December flight is designated VA221 in Arianespace’s numbering system for its family of launchers, which also includes the medium-lift Soyuz and light-lift Vega.